Daniel Ricciardo proved Red Bull Racing's pace around the streets of Monte Carlo by setting the fastest time in FP1 on Thursday morning. 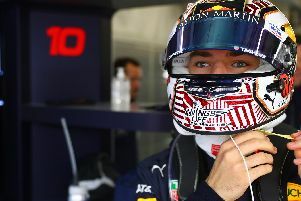 The Australian completed 36 laps of the tight track, setting a fastest time of 1:12.126, a little under two tenths ahead of team-mate Max Verstappen who set 1:12.280 in second after 25 laps. World champion Lewis Hamilton was third - nearly a second off Ricciardo's pace - ahead of Ferrari duo Sebastian Vettel and Kimi Raikkonen in fifth. Red Bull were the fancied team heading into the jewel in F1's crown, notoriously good when the downforce is ramped up. The second practice session starts at 2pm (UK time).